"Now this is the story all about how, my life got flipped turned upside down..." Not quite, but the Fresh Prince theme song will grab anyone's attention...Now that I have you, let's talk about me for a minute. My name is Brandon Dufour, I grew up in Bethlehem CT, went to a small boarding school called The Gunnery, spent 7 years in New York City working on songs, then moved back to Connecticut to start a driving school. Almost 7 years later, I married the most beautiful woman on television that blessed me with a now 6 month old rockstar son, and I still spend my work days running this little driving school in Watertown. It is important for you to know, from the start, that my life is great. I wake up happy, I go to bed happier, and I work hard to make sure that everything that happens in between leaves the whole world a better place because of my efforts. There will be times in the next few minutes where I sound whiny, and I don't mean to, but as one of my favorite college professors told me "just be authentic, the readers will always appreciate an honest pen." 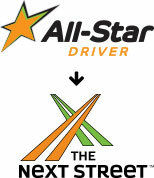 This is my authentic, transparent, and honest story of why All-Star Driver is becoming The Next Street.